Damn! This is the second time I have seen this in as many days.. (thanks kids :/) Fortunately there were things that saved my bacon.. 1. The kids stopped and yelled for me, 2. Running the latest no-script, MalwareBytes 2.X Pro on FF 30 (with other add-ons) so with all that yelling going on, NS, MB, kids and me, I killed the PID and was fine. However, this did NOT come from BING-A-DING but someone else and they do not remember where. I do not use BING, GOOGLE but DDG or Startpage and >90% of the time on TOR. However I was lucky, even though I have full BU.. I would have scorched the earth and we know how much fun that isNOT! Oh.. and since you can't stop kids even know they are not to play on my system, now the keyboard and rodent are locked in the safe when I leave. 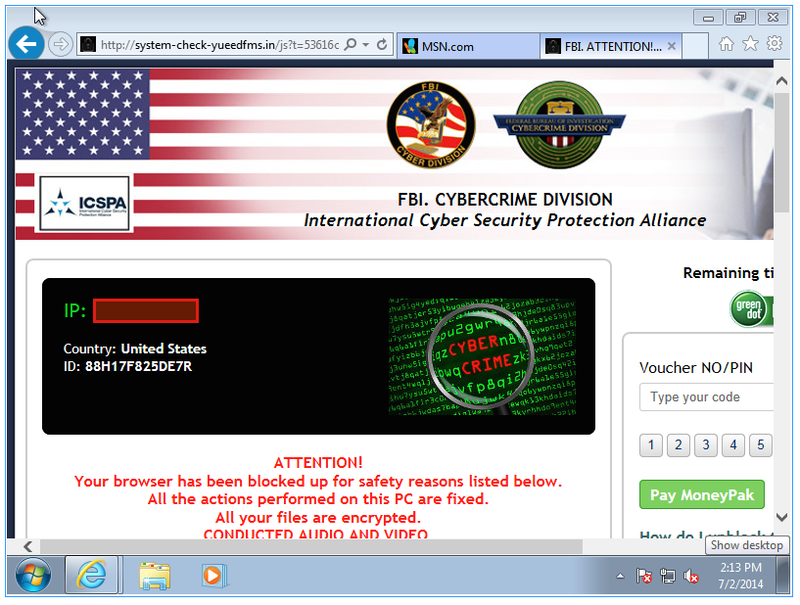 Since this is spread via Bing, should we now go and seize their domains to stop the malware? Your post brought me a plethora of edification.. I shall elucidate. Contemporaneously my children ages 4 and 5 could go out and purchase a wireless USB keyboard or mouse, however care to place odds on that happening? It is almost as off base as your myopic analogy of what I have "trained" my children to do. Maybe you toss "sardines" to your kids for rewards, or have them sit on a stool staring @ two converging angles or lines (corner) that is your privilege, I do not. To all others, forgive me diverging off the theme of the post for this retort, gotta love the "drive by" Anonymous, as they post a wealth of <input here>. Instead of rebooting, won't Alt-F4 work? That should close the browser's .exe. It's still there and it's been 24 hours. I think we should get a judge to to seize bing.com, just think of how many computers have been affected because they've obviously ignored the abuse report. While I wasn't the Anonymous poster (this is my first post) I would ask why not just require a password to access the system instead of physically locking up the peripherals. Maybe I took your post too literally. Unless the 4 and 5 year olds are familiar with live-booting or are really good at guessing passwords. Whatever works for you though. Your house your rules.